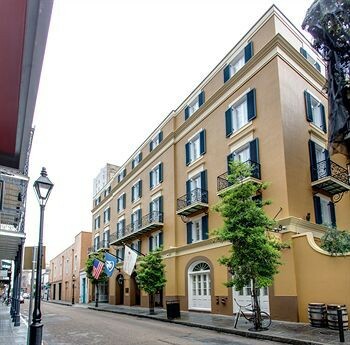 This boutique New Orleans hotel is set between Bourbon Street and Royal Street in the French Quarter, 3 blocks from Jackson Square, and within 1.6 km of the Riverwalk Marketplace, the French Market, and the Aquarium of the Americas. The hotel wraps around a secluded, Mediterranean-style fountain courtyard. Louis Armstrong New Orleans International Airport is situated at a distance of approximately 19 km.FacilitiesThe hotel features 90 accommodation units. Guests can reach the upper floors quickly and easily using the lift. Services and facilities at the hotel include a cloakroom, internet access, wireless internet access, a restaurant, a breakfast room, a bar and room service.RoomsAll rooms feature air conditioning, central heating and a bathroom. Each accommodation unit features a queen-size bed or a king-size bed. A safe and a desk also feature. The accommodation units offer a range of amenities, including tea and coffee making equipment. An ironing set is also available to guests. Convenient features include internet access, a telephone, a TV, an alarm clock and wireless internet access. Guests will also find slippers provided. In each of the bathrooms, guests will find a shower, a hairdryer and bathrobes.Sports/EntertainmentThe hotel offers an outdoor pool. The terrace is the perfect place to while away the time. MealsThe hotel offers the following bookable meals and board options: breakfast, lunch and dinner.PaymentThe following credit cards are accepted at the hotel: American Express, VISA and MasterCard.